The National Autistic Society (NAS) provides information, support and programmes for people with autism and Asperger syndrome. Director of Finance, Kelly Evans, looks after four teams – Accounts, Procurement, Project Management and Property Management for NAS – based in Bristol, London and dispersed in local communities all over the UK. There are 40 people in the team, who are geographically spread all over the country. With split locations, it’s difficult to get them together for a team meeting, but they also have very diverse skill sets. For previous team away days, Kelly has focused on work-related themes, but it was always a challenge to devise activities which would be meaningful for everyone. Despite their differences, everyone has been impacted by recent cuts in the third sector. With their day jobs becoming overwhelmingly busy, Kelly felt the single common theme for the team to address was stress. Instinctively, Kelly knew everyone would benefit from supporting each other and sharing best practice. 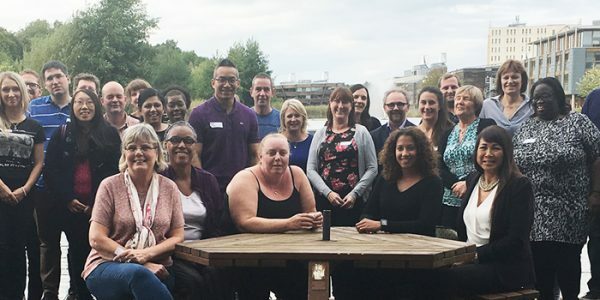 She wanted to set up an away day to explore the team dynamics, their personal reactions to pressure and to learn some strategies to tackle daily stress. “Nicky pitched the day really well by starting with scientific facts about brain structure and the effects of stress on us. In truth the stress isn’t going to go away. But after spending the away day with Discover Your Bounce for Business, the team are better equipped to handle the pressure and help each other through it. I was really proud, because I’ve never seen them behave so much as a team as they did that day and it has continued with the changes we have made." The focus of the team away day was on having fun, trying out the exercises, working together and learning new skills to recognise and tackle stress. To ensure the day was a success, Sharon and Nicky observed the participants carefully, then adapted some activities to make them more relevant for the people in the room. As the day unfolded, everyone joined in proactively, starting conversations and sharing all sorts of ideas on how they could make changes at work. One facilities manager spoke with Kelly in the coffee break, confirming his initial scepticism about the focus on ‘hippy dippy’ mindfulness. In contrast, he afterwards said how much he had enjoyed the day and was planning how he could take some of the learnings back to his local team. Working on the ‘Team Rocks’ i.e. the most important goals for the organisation. This is done as a weekly focus, with people taking individual responsibility to achieve them. Kelly’s office has become a ‘No Moan Zone’. This means the team have ten minutes to share a challenging issue out loud, but then propose a solution and receive support through this. Design of a ‘mindful walking route’ for any team member to take a break from their desk and purposely show the others when they might need some support. If someone is seen walking, they are asked whether they need a cup of tea, an ear to listen or some space. As a result of being more aware of different reactions to stress and individual learning styles, Kelly is able to tailor her approach to feedback and performance reviews. She has also found the Engage! tools useful in her leadership role among the directors in the National Autistic Society.